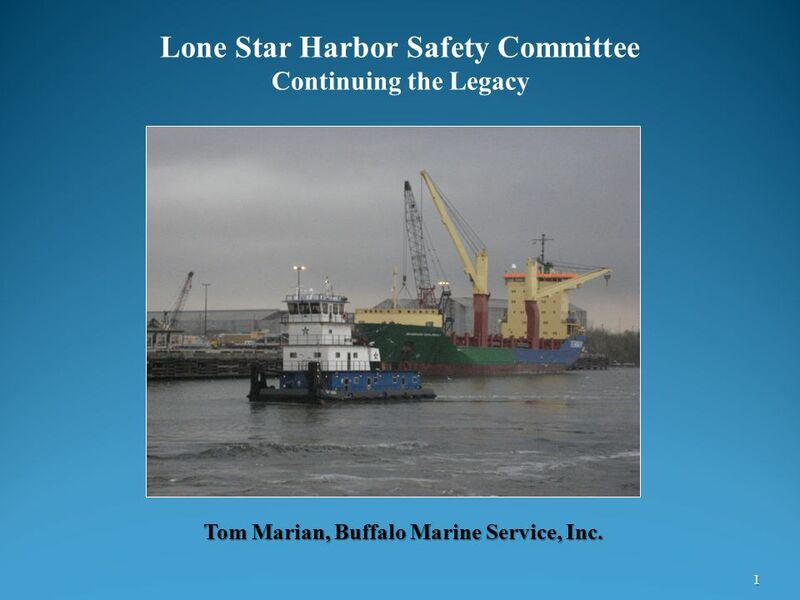 Tom Marian, Buffalo Marine Service, Inc.
1 Tom Marian, Buffalo Marine Service, Inc.
Lone Star Harbor Safety Committee Continuing the Legacy Tom Marian, Buffalo Marine Service, Inc. 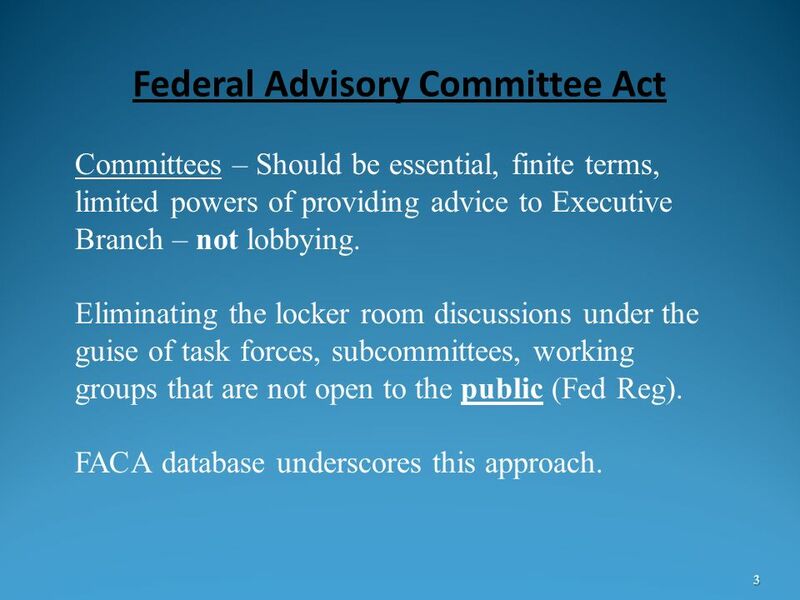 Ensure advice from various advisory committees formed over the years “is objective & accessible to public” Over 1400 federal advisory committees in 1973 report. 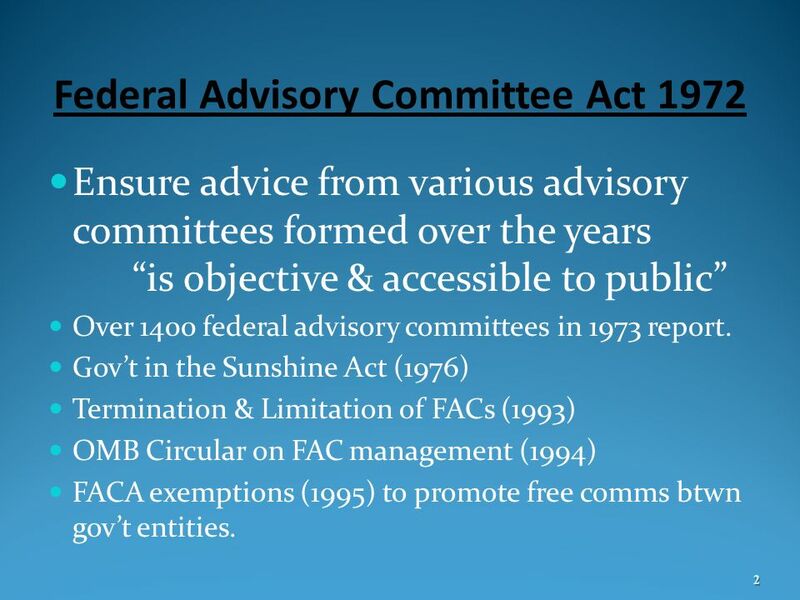 Gov’t in the Sunshine Act (1976) Termination & Limitation of FACs (1993) OMB Circular on FAC management (1994) FACA exemptions (1995) to promote free comms btwn gov’t entities. Committees – Should be essential, finite terms, limited powers of providing advice to Executive Branch – not lobbying. Eliminating the locker room discussions under the guise of task forces, subcommittees, working groups that are not open to the public (Fed Reg). FACA database underscores this approach. 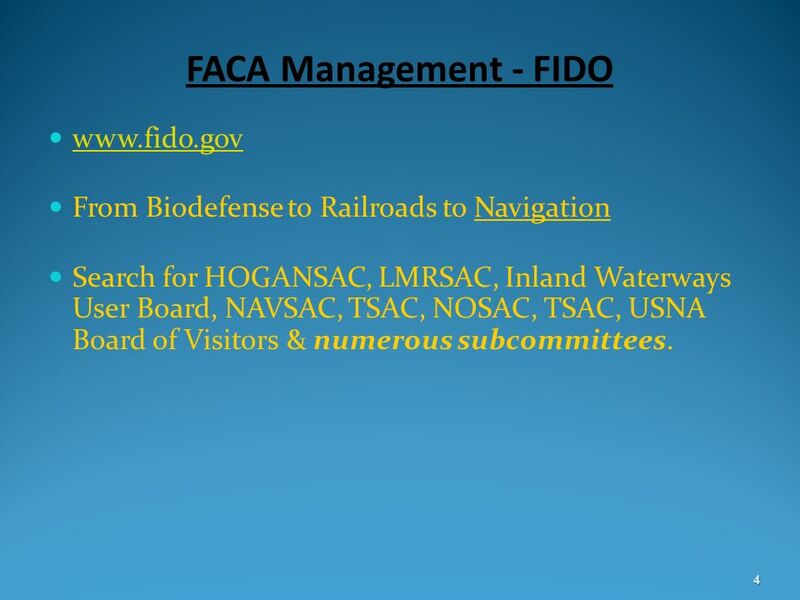 From Biodefense to Railroads to Navigation Search for HOGANSAC, LMRSAC, Inland Waterways User Board, NAVSAC, TSAC, NOSAC, TSAC, USNA Board of Visitors & numerous subcommittees. Creation of Public Law ( ) with 5 year-renewal requirement. FACA-driven. Merely codified activity since 1972! 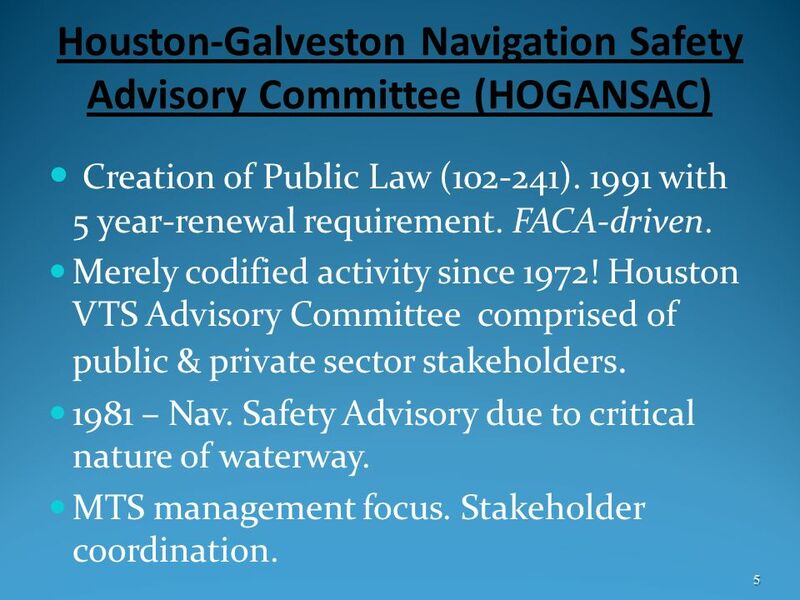 Houston VTS Advisory Committee comprised of public & private sector stakeholders. 1981 – Nav. Safety Advisory due to critical nature of waterway. MTS management focus. Stakeholder coordination. 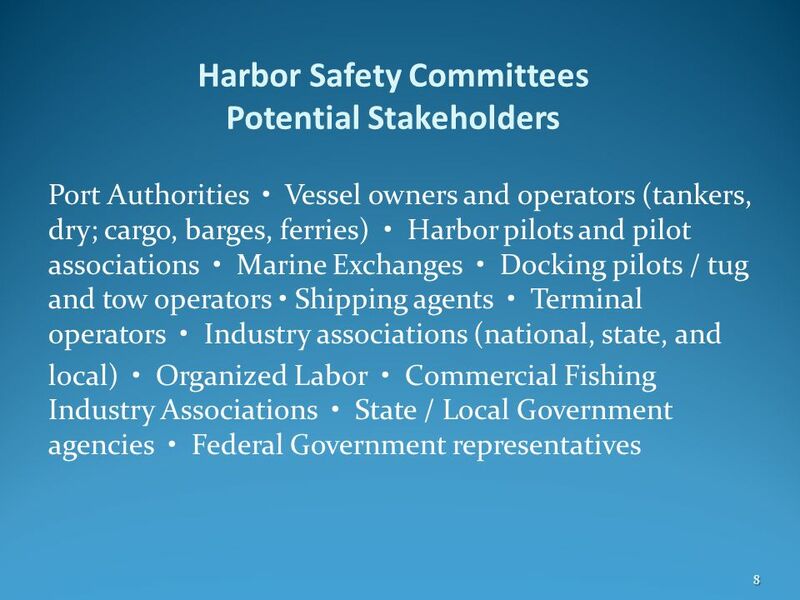 “Local committees that address safety, security, mobility & environmental protection of a port or waterway” USCG HSC Desk Reference AKA – Waterway Task Forces ; Safety Groups; Safety Councils; Coalitions; Management Fora; Marine Action Teams; Port Safety Councils; Safety Associations; Reaction Teams; Coordination Committees. 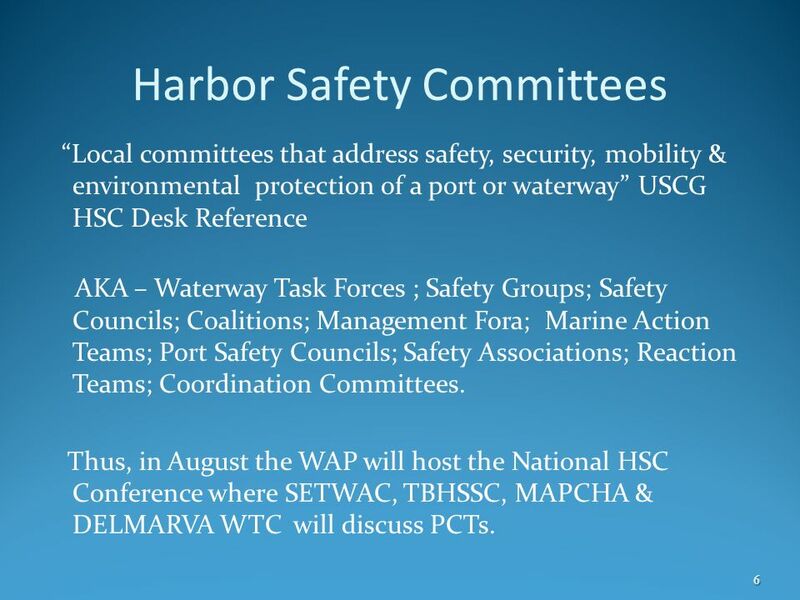 Thus, in August the WAP will host the National HSC Conference where SETWAC, TBHSSC, MAPCHA & DELMARVA WTC will discuss PCTs. Over 80. 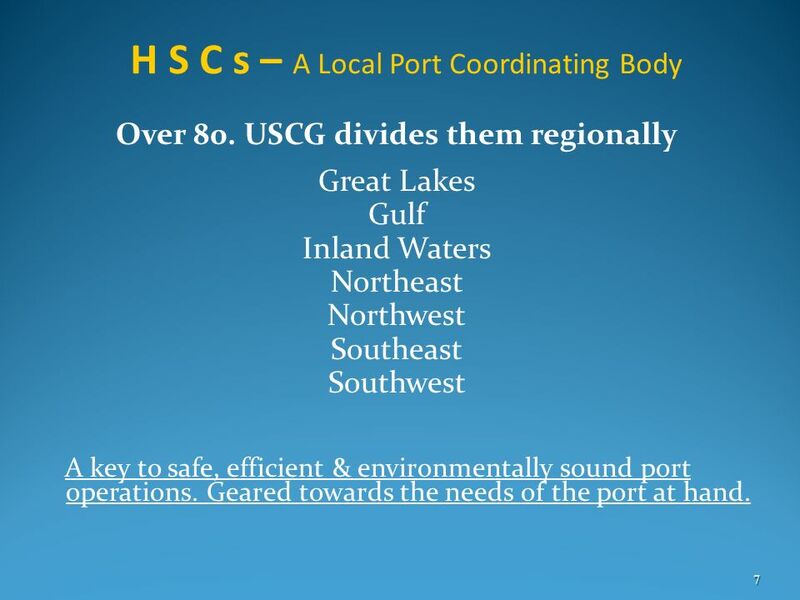 USCG divides them regionally Great Lakes Gulf Inland Waters Northeast Northwest Southeast Southwest A key to safe, efficient & environmentally sound port operations. Geared towards the needs of the port at hand. 9 Lone Star HSC HOGANSAC charter in limbo due to DHS review. Imperative of remaining engaged with Stakeholders. Fall 2011 scoping session & “town hall” meetings. SETWAC Charter & USCG HSC Instruction as guidance. Membership the most significant hurdle. Process next. 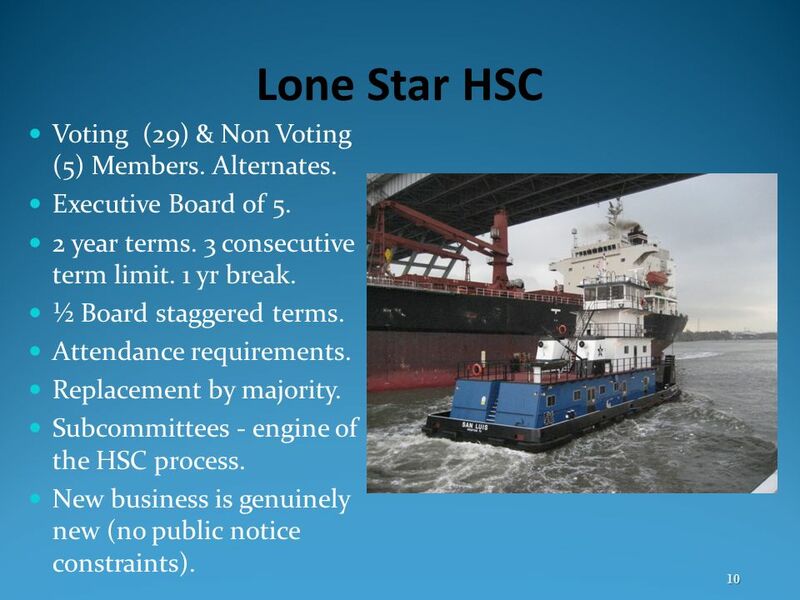 10 Lone Star HSC Voting (29) & Non Voting (5) Members. Alternates. Executive Board of 5. 2 year terms. 3 consecutive term limit. 1 yr break. ½ Board staggered terms. Attendance requirements. Replacement by majority. 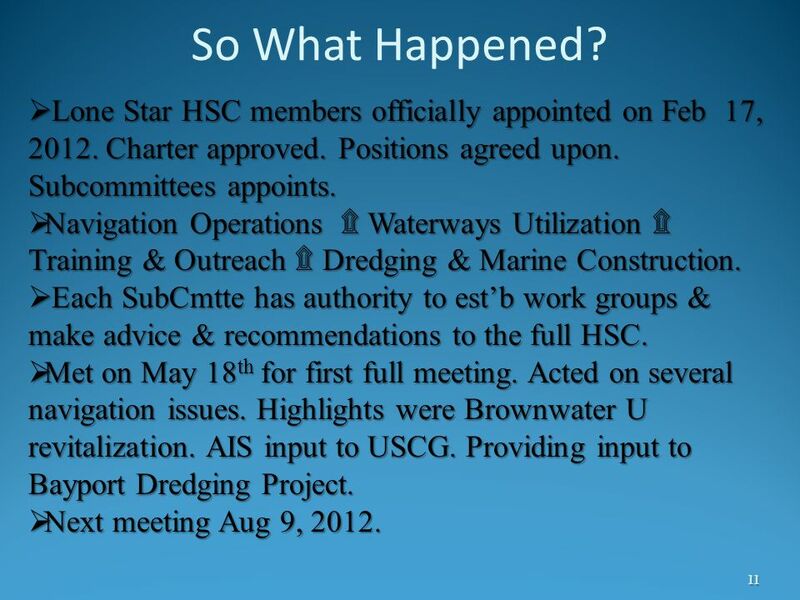 Subcommittees - engine of the HSC process. New business is genuinely new (no public notice constraints). 11 So What Happened? 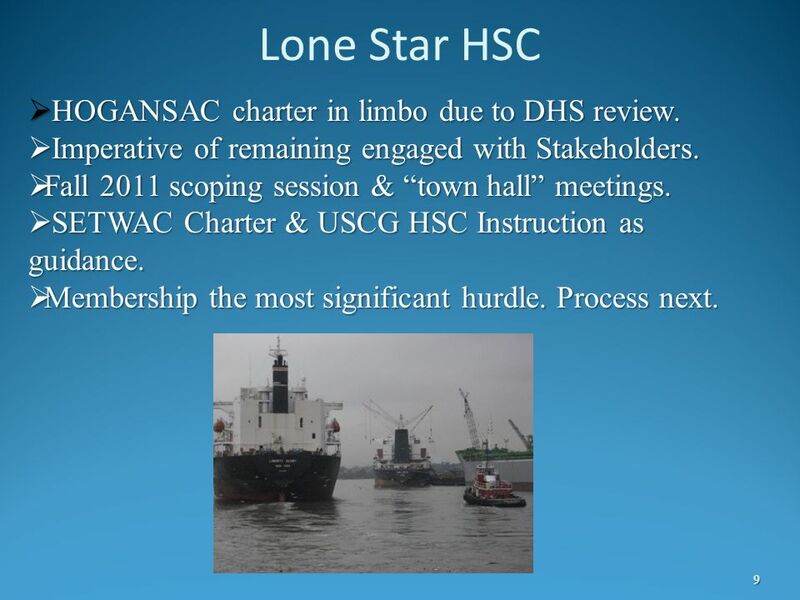 Lone Star HSC members officially appointed on Feb 17, Charter approved. Positions agreed upon. Subcommittees appoints. Navigation Operations ۩ Waterways Utilization ۩ Training & Outreach ۩ Dredging & Marine Construction. Each SubCmtte has authority to est’b work groups & make advice & recommendations to the full HSC. Met on May 18th for first full meeting. Acted on several navigation issues. Highlights were Brownwater U revitalization. AIS input to USCG. Providing input to Bayport Dredging Project. Next meeting Aug 9, 2012. 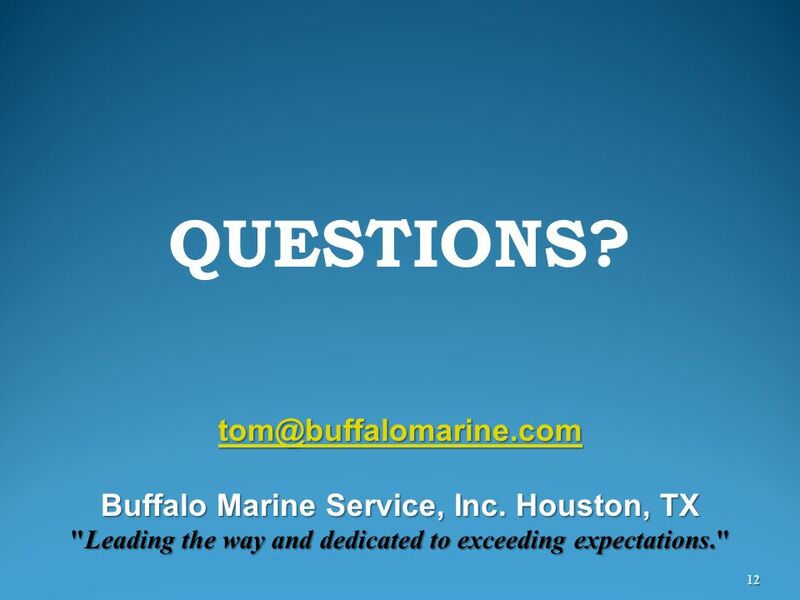 Buffalo Marine Service, Inc. Houston, TX "Leading the way and dedicated to exceeding expectations." Download ppt "Tom Marian, Buffalo Marine Service, Inc."
Coastwise Coalition. An integrated, multi-modal system in which coastwise and inland shipping operates in conjunction with rail and trucking to: Increase. Membership & Roster Maintenance Officers Training Workshop September 2012 Kevin Shanahan 1. County of Fairfax, Virginia Department of Transportation Transportation Funding Alternatives and Outreach Board Transportation Committee June 12, 2012. 1 Office of Global Maritime Situational Awareness A National Coordination Office Mr. Gary Seffel, Director (Acting) March 2009. 1 WTO TRADE FACILITATION Trade Facilitation Task Force (Committee, Working Group, etc) Sheri Rosenow WTO Trade Facilitation Section Trade Policies Review. Standards Development and Approval Process Steve Rueckert Director of Standards Joint Guidance Committee WECC Leadership Annual Training Session Salt Lake. 1 Permanent International Association of Navigation Congresses - PIANC July 15, 2008 RIS - RIVERS INFORMATION SYSTEM Our Invisible Transportation Network. One Team: Relevant, Ready, Responsive, Reliable 1 Permanent International Association of Navigation Congresses - PIANC July 15, 2008 RIS - RIVERS INFORMATION. Homeland Security Information Network-Emergency Management (HSIN-EM) Fire Service Community Overview Technologies for Critical Incident Preparedness Conference. Back to the Drawing Board Summary of the work of the Human Services Redesign Committee from May 2012 forward. What is the Oklahoma DD Council? Oklahoma Developmental Disabilities Council. Coast Guard & Coast Guard Reserve: An Overview Office of Reserve Affairs Coast Guard Headquarters Washington, DC. United States Coast Guard Marine Safety, Security, and Stewardship 1 U.S. Coast Guard Regulations “Making a difference” 1 Jeff Lantz Director, Commercial. W ATER R ESOURCES P LANNING (ACT 220) and the S TATE W ATER P LAN. Marine Exchange of Puget Sound John Veentjer Executive Director, Puget Sound Marine Exchange President, Maritime Information Services of North America. Title: Protocols for Maritime Transportation System Recovery Author: Sean K. Moon Economy: United States of America. Maritime Information Services of North America A non-profit maritime organization established to provide information, communications and services to ensure. EISWG The Environmental Information Services Working Group of the NOAA Science Advisory Board Raymond J. Ban April 22, 2009.